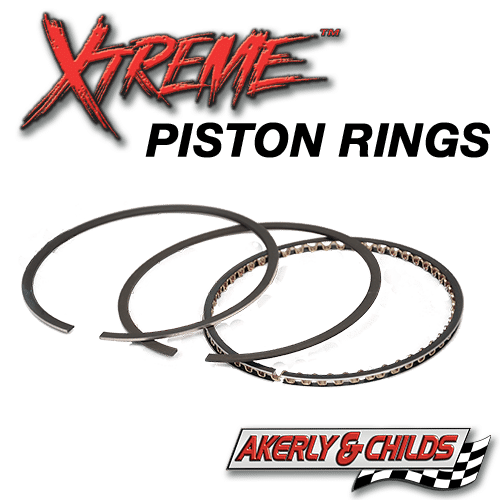 Akerly & Childs High Performance Piston Rings are engineered to provide the best possible sealing for maximum power output. To meet the needs of today’s harsh performance environment Akerly & Childs offers compression rings in multiple materials, widths and types. Material choices include cast iron, ductile iron, and steel. Our claimer sets feature a cast iron or cast moly filled top compression ring, while our premium standard gap and file fit sets feature a ductile iron or steel plasma-moly filled top ring. Material choices include cast iron, ductile iron, and steel. Our claimer sets feature a cast iron or cast moly filled top compression ring, while our premium standard gap and file fit sets feature a ductile iron plasma-moly or steel plasma-moly filled top ring. Piston Rings designed To Minimize Cylinder Leakage, Provide Instant Seating, Control “Blow By” & Increase Power Output.